Blendtec blenders are among the top high performance blenders out there. Pro atheletes and fitness junkies will love one because of its smoothie making abilities, while many cooking enthusiasts will find that they can make the smoothest hot and cold soups, purees, sauces and doughs in a matter of seconds. That is because their blending jars are designed to do all of the above and the motor horsepower is second to none. Throw in the durability and first class warranty and you can see why. But “which Blendtec to buy?” is a common question that many high end blender buyers have. We attempt to pick the top 5 Blendtec models available today based on performance, features and price. The last factor is important because many first time buyers ask another question – “How much are Blendtec blenders?” Other than the answer being “a lot”, the models and series vary quite a bit and you may find that your needs will require nothing more than one of the cheapest models, or you if you want the most advanced blender and money is no object, you can spend upwards of $1000. You can get a bottom of the line model for about $400 and be thrilled with the results everytime. Before we get any further, we have to point out that there is a direct competitor brand to Blendtec and that’s Vitamix. Unless you’re absolutely dead set on getting a Blendtec, you might want to check out Vitamix blenders too. We have reviewed Vitamix blenders to help you decide which one would be the best for you to buy. Now it’s time to review the Blendtec blenders. While Blendtec has the cheapest blender of the two brands, it also has the most expensive. As with Vitamix, you can also consider buying a certified refurbished one if you find brand new models too expensive for you. Before Vitamix came out with the brand new high tech G-series 780 model, they always dominated with users looking for simple to use intuitive controls on high end blenders, while Blendtec has appealed to users that wanted fancier options. The older line of Vitamix is also very tall and don’t fit under standard kitchen cabinets. If that’s a concern, you’d have to pick a new model Vitamix or any Blendtec. You can find the whole range of new and certified refurbished Blendtec blenders and accessories on Amazon USA and Amazon UK. Before we review our top 5 Blendtec picks, let’s take a quick look at the three jars that the company makes. Whenever you buy a blender, you’ll get one of these jars but you can also buy any of them separately to get the full blending experience. The Wildside Jar was invented by Blendtec, and although some other companies have copied the design and Blendtec even won a court settlement from one prominent blender company because of an exact copy, if there ever was a do-it-all blender jar, this is the one. The Wildside gets its name because it is essentially a 4 sided blender jar with an extra fifth side. This wild side is essentially a flattened corner, and it changes the vortex created by the rotating blades. What this means is that all of the ingredients, top to bottom, get sucked into the blades and mixed completely, from liquids to solids and everything in between. There are no dead spots and no places where clumps can hide. Everything in the blender gets channeled towards the blades, which works great for frozen foods like ice cream or heavy duty ingredients like bread dough. The easy Gripper lid allows you to add ingredients through the center opening and releases pressure when you blend hot liquids. This is the jar you want if you usually work with large volumes or heavy duty tasks. This is the standard Blendtec jar and it gives a good account of itself for lots of blending job. The square sides of the jar blend every ingredient better than regular round jars, and this is the jar that made the Blendtec Blender what it is today. The FourSide Jar works best for grinding dried foods and grains, making soups and, of course, smoothies. You may also prefer this jar if you usually work with regular or small quantities. Like with the WildSide, it comes with the Gripper lid. The actual jar is round, but it comes with a twist. Yes, the Twister lid of the jar is equipped with built-in spatulas that hug the inside of the jar when the blender is running. You actually “twist” the cover and the twin spatulas keep feeding the ingredients back toward the blades. You also get the easy Griper lid with the Twister jar. The spatulas works great for heavier and gooey types of food, like hummus, nut butters and even making baby food. It is another unique and functional idea from Blendtec that make their blenders incredibly versatile. Any and all of these jars are easily interchanged within the Blendtech line. They are all made of heavy duty BPA-free plastic, and they are virtually indestructible. The stainless steel blades are two pronged and can crush ice easily. No seeds will be left if you make a berry smoothie. Although every specific Blendtec Blender comes with its own standard blending jar, you can get one of the others as an option from Blendtec itself. The Blendtec Total is the descendant from the blender that made Blendtec famous. A 1560-watt, 3 horsepower motor and the patented 2 quart FourSide jar make this unit a workhorse for every day blending tasks. It has a digital button touchpad with 6 pre-sets, including mixed drinks, smoothies, ice crush, ice cream and hot soups. It also has the unique batters preset button which may be particularly valuable if you are into mixing batter and dough. The auto shut-off feature lets you select any of the presets and walkaway. There are 10 speeds and a pulse button for extra control when required. It comes with a 3 year base warranty and a 1 year jar warranty, but you’ll have to get them fast because this model is being discontinued. It’s easy to use, and if you want a new basic high performance blender that can do pretty much anything, this is a great choice, although it is only available in black. This is one of the better deals in the Blendtec line. You can’t always find them, but if you don’t mind having a refurbished unit, this is certainly a Blendtech to consider. It’s the same discontinued Total blender listed right above, but this one comes with the WildSide jar. Better still, it leaves the factory with a full 7 year certified warranty. Not only that, but it is less than half the price of a new Total Blendtec Blender. If that doesn’t get you in the market for a Blendtec, nothing will. This is a combination of the Total blender and the discontinued Signature series. While the Total is probably the best Blendtec for beginners who will appreciate the simple presets, the Classic 575 gives intermediate users a little more control. The Classic 575 Blendtec also features touchpad controls but comes in 6 colors. It is a 1575 Watts, 3 horsepower unit and comes with an 8 year warranty. The only presets you’ll find here are Smoothie, Clean, 60 seconds and 90 seconds, and you get five incremental speeds and a pulse button to choose from. With these options you’ll have to test the unit out while making things other than smoothies for the first time, but once you figure out what works, it’s easy to use and you can make just about anything from salsas and hot soups to nut butters. While there are fewer available speeds to choose from, these really are quite enough for most cooks. You can manually switch from one 50-second speed setting to the next anytime you want or even push the Pulse pad midway for a burst of power. The lack of more presets means that you probably can’t start a job, leave and then come back to find a completed blending task. Instead, you can use the timed 60 and 90 second cycles to finish other jobs in the kitchen while each cycle runs. However, you might want to keep a hand on it if you blend frozen fruit or hard foods like carrots, as the base may jump around a bit on the counter. The Clean cycle is quite a convenient feature too – just put in a drop of dish wash liquid with water and start it. You can also get a factory reconditioned Classic 575 for a lot less that comes with a 7 year warranty. This is the least expensive and simplest Designer series blender, but that doesn’t mean it is down on features or power. The Designer 625 comes with a 3 horsepower motor, and a neat illuminated touch screen control panel that is flat for easy cleaning. The panel is 6-speed capacitive, which means it can detect where on the speed slide display the user touches and responds immediately to the nearest speed point. There are 4 presets on the electronic keypad – for smoothies, juicing, ice cream and hot soup. The display will count down the remaining time for each cycle. If you want to blend manually, you can select one of the 6 speeds by moving your finger along the electronic slider, and for an extra burst, touch the pulse button. The base is heavier than the Total and Classic Series so it won’t jump around during tough tasks. Unlike with the Classic 575, there is no Clean cycle but you can do it manually by running it for a few seconds with dish soap and water. The plastic blending jar is the Wildside version, the unit comes with an 8 year warranty and it is available in 7 different colors. It’s a good choice for beginners looking for a blender that eliminates guesswork and looks modern and stylish in the kitchen. If you want more power, more presets and a blender with smart capabilities, the Designer 725 fits those needs. The 3.8 horsepower motor is up to virtually any blending task and the touch screen selectable presets include smoothies, salsa, hot soups, ice cream and a unique cleaning function. There are 100 speed settings on the capacitive slider, so you’ll always find the right blending speed, and you can add 10 seconds to any preset just by pushing the “Add 10” button. The Designer 725 is the first blender to have a brain. It senses when there are things like air holes in the blending cycle, ice jams, filling the jar too full or even if the blender begins to overheat. The blender will shut down and the control panel will tell you what the problem is. It will even give you suggestions on additional uses and preferred blending speeds when mixing, pureeing, chopping, etc. The Multi-Speed Pulse gives you extra power at any speed, so you’ll never be short on muscle when blending. This blender is available in Stainless Steel and Gunmetal grey. The Designer 725 is the top of the line in the Designer series, and with features like that you can see why. However, some customers say that the blender tends to walk on the counter when blending tough ingredients. For the ultimate blending machine, it’s the Professional 800. Not only is it loaded with features, it is the quietest blender that you can get. The Pro 800 can do virtually every blending task and do it quietly. That’s a big deal because other Blendtecs are known to be very noisy. The blender is housed within a sealed sound enclosure that does not interfere with adding ingredients. The 3.8 horsepower motor has power to burn, and the unit comes with the fabulous 8 year warranty. It comes with the Wildside jar, but the extra features are where it really shines. The presets include mixed drinks, smoothies, hot soups, frozen treats, whole juice and the batters selection. It is one of the few Blendtecs with a preset for batter, and if making batters and dough is a priority, this blender is worth checking out. The 11 speeds slider gives you the speed you need, and the pulse button adds a burst of extra power when needed. Even though it is very expensive, it is one of the highest ranked customer satisfaction blenders of them all, as much for its overall practical use as for the sound dampening technology. Which Blendtec blender should I buy? The Blendtech Total Blenders are extremely competent, but as stated earlier, that line is being discontinued. They each cost hundreds of dollars less than any of the others, and granted they are not technically as advanced as the Designers or the Pro model, but they are still some of the best machines in the blending world. The refurbished model is the best bang for the buck Blendtech you’ll ever come across, but again, the supply is limited so you may have a difficult time finding one. The Classic 575 is also good bang for your buck if you want more control over the tasks and you’re not the kind to salivate over fancy features. The reality is that if you want to see what a Blentec Blender is all about without going overboard on price, these are your best bets to put a Blendtech on your counter top. The Designers are high tech in every sense of the electronic word, with the 725 actually having a computerized brain that can help you blend or troubleshoot a problem. Of course this technology doesn’t come without a price and you’ll have to ask yourself if the expense is worth it, but on the other hand, if you are looking for versatile presets and maximum speed control, these are the two you should be considering. 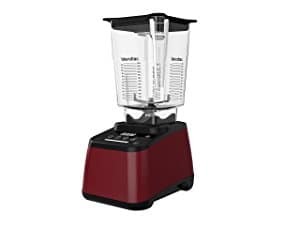 The Professional 800 is technically the most accomplished blender here, with the unique batter preset that only comes on lesser models, However, the Pro 800’s claim to fame is the stealth technology used to make it exceptionally quiet. It will do virtually anything the others can do but it will do it with very little noise. Obviously in any noise compromising situation, this must be the Blendtec Blender to buy, if you can afford the exorbitant price tag, that is. There are better Blendtecs for the money, but if you need to be quiet when making a smoothie or mixing batters and kneading doughs, this is the only blender that will give you that. For other brands that make a quiet model, check out this list.